Open study to investigate if the eradication rate of H. pylori in adults is improved by L. reuteri DSM 17938, as an adjunct during 10-day eradication therapy and for 10 days thereafter. Forty-five (45) patients were included. The rate of eradication was 93.3% (42/45). In 2/4 (50%) previously treated for H. pylori the infection was also eradicated. Side effects were reported in 8 subjects: mild diarrhoea for a few days (n=5), and abdominal discomfort (n=3). Proton pump inhibitor-tetracycline-metronidazole-L. reuteri therapy provided high eradication rates with few side effects, and excellent compliance. The eradication rate of Helicobacter pylori following the standard triple therapy is declining. This study was conducted to test whether the addition of a new whether the probiotic Lactobacillus reuteri Gastrus (L. reuteri DSM 17938 and L. reuteri ATCC PTA 6475), as an adjunct to standard triple therapy, improves the eradication rates as well as the clinical and pathological aspects in Helicobacter pylori infection. A total of 70 treatment naive patients were randomly assigned into group A (the Lactobacillus reuteri treated group) and group B (the placebo control group). Patients were treated by the standard triple therapy for 2 weeks and either Lactobacillus reuteri or placebo for 4 weeks. They were examined by symptom questionnaire, Helicobacter pylori antigen in stool, upper endoscopy with biopsies for rapid urease test and histopathological examination before treatment and 4 weeks after completion of the supplementation period. The Helicobacter pylori-associated gastritis was significantly improved at the follow-up at 8 weeks, with reduction in the scores of inflammation and activity within both groups. The improvements were, however, stronger in the L. reuteri group compared to placebo: p<0.001 and p<0.05, for the inflammation and the activity score, respectively. Triple therapy of Helicobacter pylori supplemented with Lactobacillus reuteri increased eradication rate by 8.6%, improved the GSRS score, reduced the reported side effects and improved the histological features of Helicobacter pylori infection when compared with placebo-supplemented triple therapy. This prospective, open-label, pilot study aimed to evaluate the therapeutic role of either Lactobacillus reuteri ATCC 55730 (1 x 10^8 CFU, twice daily) or a multi-strain, high-dose probiotic (2 x 10^10 CFU, twice daily) in addition to standard triple therapies for Helicobacter pylori eradication in 65 consecutive dyspeptic patients with Helicobacter pylori infection. Patients were assigned to either a standard 7-day triple therapy regimen, a standard 7-day triple therapy regimen + Lactobacillus reuteri supplementation, a standard 7-day triple therapy regimen + multi-strain probiotic, or a 14-day triple therapy regimen + multi-strain probiotic. No regimen achieved >80% eradication rate. A 14-day therapy plus the multi-strain probiotic tended to achieve a higher eradication rate (71%) although there was no statistically significant differences in terms of eradication rates between the tested regimens (7-day: 62%; 7-day + Lactobacillus reuteri: 53%; 7-day + multi-strain probiotic: 53%). Side-effects were lowest in the 7-day + Lactobacillus reuteri group (6%), but there were no statistically significant differences between the groups (7-day: 27%; 7-day + multi-strain probiotic: 20%; 14-day + probiotic: multi-strain 33%). Conclusion: 7–14 days triple therapy with or without probiotic supplementations failed to achieve acceptable Helicobacter pylori eradication rates. This was a prospective, double blind and placebo-controlled study in 40 dyspeptic adults infected with Helicobacter pylori. It tested whether Lactobacillus reuteri ATCC 55730 reduces the Helicobacter pylori levels in the stomach, decreases dyspeptic symptoms and affects the results of conventional treatment with antibiotics. The subjects were randomly assigned to take Lactobacillus reuteri (1 x 10^8 CFU/day) once daily for 28 days, or placebo. Thereafter all were treated with three antibiotics and stomach acid suppressing medicine for 10 days. All subjects underwent upper endoscopy for biopsy samples from the stomach, 13C-urea breath test (UBT), and Helicobacter pylori stool antigen (HpSA) test at entry and after 4 weeks of treatment. The validated Gastrointestinal Symptom Rating Scale (GSRS) was used to assess changes in gastrointestinal symptoms. Lactobacillus reuteri reduced Helicobacter pylori levels in the patients after 4 weeks of treatment: UBT decreased from 33.8 to 27.3 ‰ (p < 0.05) and HpSA decreased in the Lactobacillus reuteri group from 18.1 to 14.4 Net/Co (p < 0.05). Both these parameters were increased in the placebo group. Lactobacillus reuteri also decreased the GSRS values significantly as compared to pre-treatment value, 7.9 vs. 11.8 (p < 0.05), while there was no decrease in GSRS in those receiving placebo, 9.7 vs. 11.4 (p = not significant). Abdominal distension, disorders of defecation and gas were the symptoms affected in particular. There was no difference in the effect of subsequent antibiotic treatment of Helicobacter pylori between groups, and no report of adverse events. Fig. 1 Helicobacter pylori bacterial load assessed by 13C-urea breath test (A) and HpSA (B) before and after placebo or Lactobacillus reuteri supplementation. 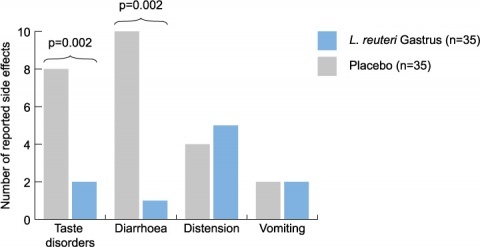 Conclusion: Lactobacillus reuteri effectively suppressed the Helicobacter pylori infection and reduced the overall occurrence of dyspeptic symptoms, particularly abdominal distension, abnormal defecation and gas. Lactobacillus reuteri did not affect or interfere with the antibiotic treatment of the infection. A study investigating whether the urea breath test (UBT) could be used as a marker for burden of Helicobacter pylori infection and if administration of Lactobacillus reuteri ATCC 55730 in a chewable tablet could suppress the Helicobacter pylori level as assessed by the UBT value. In the first study, gastric biopsies were obtained from 33 Helicobacter pylori- positive adults by upper gastrointestinal endoscopy, and the individual UBT values were established for each subject. It was shown that the individual UBT value increased significantly with the extent of the Helicobacter pylori density on the biopsies. In the second part of the study, 40 subjects infected with Helicobacter pylori, but without symptoms, were enrolled. 35 had UBT values ≥ 15 ‰ and were randomly allocated to three groups: Group A ingested Lactobacillus reuteri for 4 weeks and placebo for another 4 weeks; group B received the two study products in the reverse order for 4 + 4 weeks; group C received only placebo for 8 weeks. Group D consisted of 5 Helicobacter pylori-negative subjects who ingested Lactobacillus reuteri only for 8 weeks. Fig. 1 Helicobacter pylori bacterial load during oral supplementation with Lactobacillus reuteri in all Group A and B patients. A significant decrease in UBT values was shown in groups A and B after ingesting Lactobacillus reuteri. Moreover, in group A the lower UBT value was maintained until the end of the full 8-week period. The overall rate of decrease in the UBT value due to ingestion of Lactobacillus reuteri tablets was 69.7 4.0% (p<0.05). Conclusion: Administration of Lactobacillus reuteri significantly decreased UBT values in Helicobacter pylori-positive subjects, demonstrating that Lactobacillus reuteri suppressed Helicobacter pylori density.